NEWTOWN -- Caroline Phoebe Previdi, 6, was eulogized Wednesday as a sweet little child who loved to draw and loved to dance. "She was happy. She was innocent. She danced everywhere she went," said Pam Fehrs, her face tear-swollen as she left Saint Rose of Lima Church on Wednesday afternoon. Fehrs daughters went to ballet and jazz class with Caroline, who was one of 20 children and six teachers murdered Friday at Sandy Hook Elementary School. "It was very sad in there," said Joan Fehrs, Pam's mother. She said it was painful. Many who came to the service wore green and white ribbons in tribute to the victims. Others wore pink, said to be Caroline's favorite color. Caroline was eulogized by her brother, Walker, a third grader and a Boy Scout. Some adults headed into the early afternoon service wore uniforms from the Scatacook District Connecticut Yankee Council, which includes Newtown. Her parents, Jeffrey and Sandy, also spoke. "They tried to remember happy things. There were a lot of good memories," said Brian Smiffin, who works at a country club the family belonged to and where Caroline would swim. Her mom called her a precious angel. 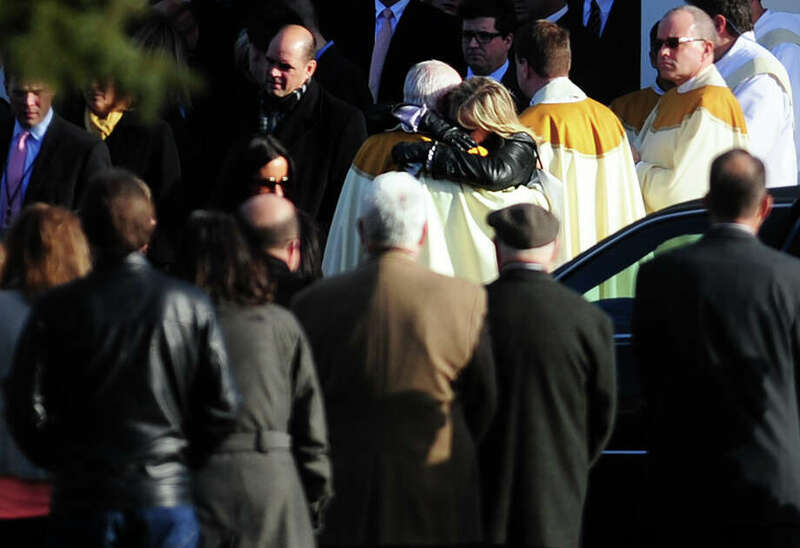 Monsignor Robert Weiss told mourners that Caroline was probably the happiest addition to heaven in a long time. "It is the hardest thing to deal with, you never would have thought we would be going to one of their funerals," said Sean Farrell, who also worked at a country club. "She was wonderful. At that age they are all wonderful," said one of Caroline's great aunts, who didn't want to give her name. Caroline was described as sweet and beautiful, with an infectious smile. Throughout the 90-minute service, nearly 50 police motorcycles were parked side by side in front and to the left of the church. They represented a dozen police departments including Trumbull, Milford, Hamden, Westport, Darien, Fairfield and Ossining, N.Y.